A decade after the beginning of political transformations in the former socialist countries in Eastern Europe, substantial diferences still remain in the level of political freedom and economic liberalization reached by each one. Great expectations born at the end of the communist system have not yet come true in some countries. While in countries like Hungary, the Czech Republic and Poland the privatization process has ended happily and the levels of political freedom are comparable to those in developed western countries, in other countries this has not happened in the same way. The former republics of the Soviet Union are the best examples of difficulties acompanying transition. Moreover, some of these countries have suffered reversals that cast doubt about the future of reform. The transformation of centralized economies to market economies has been a challenge to understand because of the lack of previous experiences and antecedents for the process initiated. One of the crucial points of the early debate was whether the reforms should be undertaken drastically and in a short period of time or step by step in order to avoid traumatic economic shocks which could jeopardize the stability of the incipient democracies. The pioneering studies on the transition process were mainly focused on explaining the causes of the fall in output during the first years of transition. These studies show that reforms, altough not free from hardships and difficulties, are the only way to reach the path of sustainable recovery. Without generating a theoretical background, these empirical works corroborated the link between the intensity of the reform process and the length of recession that affected all countries undergoing transition. It was also shown that success in macroeconomic stabilization was a necessary condition to achieve the goal of recovery. The works of Sahay, Vegh and Fischer (1996); Selowsky and Martin (1996); and De Melo, Denitzer and Gelb (1996) should be mentioned. In fact, in the latter, a novel contribution appeared: an index to quantify the level reached by each country in the liberalization process, comprised of indexes of privatization, free market prices and liberalization of foreign trade. Hernández-Catá (1997) developed a model to explain the causes of plummeting in GDP during the first years of transition. This work highlights the role of adjustment costs associated with the technological transformation as the main cause that explains the decrease in output. Nonetheless, this model shows that recession is only a transitory problem, which can be left behind through an aggressive liberalization process. The author provides econometric grounding for his model and supports the conclusions of previous studies on the role of economic liberalization in achieving sustainable growth. If the key to success were simply the reforms, all that countries in transition would have to do is to engage seriously in a reform program, solving once and for all the problems that affect them. Hence, it was important to answer the question: why did some countries refuse to undertake a radical program of economic reforms? Since the beginning of the last decade, it was evident that not all countries really wanted to initiate a drastic economic transformation. Hence the determinants of economic liberalization became the central part of subsequent papers on transition. Possible factors explaining economic liberalization were briefly addressed in some of the pioneering papers. De Melo et al. (1996) found high correlation between the cumulated economic liberalization index and the political freedom index for each country in 1995. In this paper, the authors stated that causality between economic and political freedom runs two ways. They argued that political freedom created a window to accelerate reforms and they also believe that economic reforms weaken the basis of the communist parties’ power. An exhaustive analysis of the role of the initial conditions in transition processes appears in De Melo et al. (1997). The authors constructed two indices to measure the initial macroeconomic distortions and initial development level in transition economies. 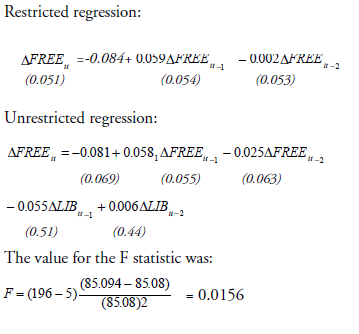 Along with other variables like the index of political freedom, these variables were tested as econometric explanations of the liberalization index. They found strong evidence that political freedom explains economic liberalization and that there is a high level of initial macroeconomic distortions at the beginning of reforms. Once the reform program is undertaken, however, they found that the adverse initial conditions do not affect the effectiveness of reforms. Despite the fact that the empirical evidence has shown the importance of political freedom in the transition from plan to market, the direction of causality is not yet clear. Futhermore, some questions remain unaddressed: Why do some countries refuse to speed reforms if initial distortions do not affect the effectiveness of reforms? Do price liberalization and trade opening contribute to easing the political situation? Which of the components of the economic liberalization index is most closely related to political freedom? In this paper we present evidence that political freedom causes economic liberalization and not vice versa. Our assertion is based on the results of a Granger causality test. We found that lagged values of changes in the index of political freedom explain changes in the index of economic liberalization, while the opposite is not true. Despite the lack of appropiate time series and the difficulties in dealing with their nonstationarity, we find no evidence of the endogeneity of political liberalization in this bivariate model. We believe these findings are useful to analyze the situation of countries where some economic reforms have been implemented, but political freedom does not exist at all. As part of this group we can mention China, Vietnam and Cuba. All of them feature the common pattern of price liberalization in a noncompetitive environment along with a big share of state ownership. Concerning political freedom, all of these countries are ruled by a single political party that seems reluctant to loosen its power over society. According to the results presented in this paper, the completion of reforms should not be expected until a democratic government takes over. The paper is structured as follows. The first section sets out the econometric model used. The second section describes the data. The third section presents the results of our econometric tests. The fourth section presents some conclusions. A simple correlation between the levels of political freedom and economic liberalization for each country for 1996 gives us an idea of the link between these two variables. Because the liberalization index rises as the economy is more liberalized and the political index is higher in non-free countries, we should expect that the correlation coefficient would be negative. From the three coefficients used to compute the annual index of liberalization, the index of privatization exhibits the highest correlation with political freedom (-0.75). We think it is not a mere coincidence, since only a government that is really committed to democracy is able to dismantle the economic base of the former parties in power. The correlations with trade and price liberalization are -0.7 and -0.6, respectively. The question remaining is whether there is feedback between the variables, as suggested by de Melo et al. (1997). A feedback process would have important implications for transition reforms: if price liberalization, free trade and new private firms can foster democracy, then the conclusion of economic reforms lead to democracy after some time. We believe that there is no reason to assume that causality between political freedom and reforms is in two ways. Our assertion is based on the argument that no authoritarian regime would be willing to undertake measures that might jeopardize its power. 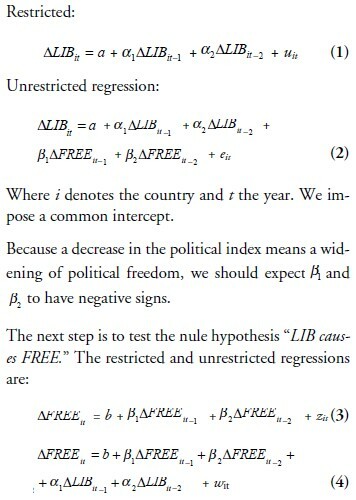 This amounts empirically to a test of the non-endogeneity of the political freedom index in a bivariate model. According to the Granger causality test, variable X “Granger causes“ variable Y if lagged values of X as a group contribute to increase the explanatory power of the regression at some significance level. The basic idea is that if X helps to predict Y, two conditions are required: adding lagged values of X in a regression of Y against past values of Y should increase the explanatory power of the regression; and Y should not help to predict X, because if X contributes to predict Y and vice versa, there may be other variables causing both Y and X. The econometric procedure to evaluate if these two conditions hold consists of two steps. First, we test the null hypothesis that X does not cause Y by running the following regressions. ESSr and ESSur are the sums of squared residuals in the restricted and unrestricted regressions; N is the number of observations; k is the number of estimated parameters in the unrestricted regression, and q is the number of parameter restrictions. The statistic follows a F(q, N-k) distribution. We can reject the null hypothesis that “ X does not cause Y”(β1,β2….βm = 0) if the group of coefficients added to the restricted regression is significantly different from zero. The next step is to test the null hyphotesis “Y does not cause X.” We should run the same regressions as above, but now switching X and Y. If we can not reject the null hypothesis that “Y does not cause X,” then we can conclude that X Granger causes Y. The number of lags in Granger tests is arbitrary, but in this case we have to face the problem that time series of economic liberalization for each country have no more than 8 annual observations. 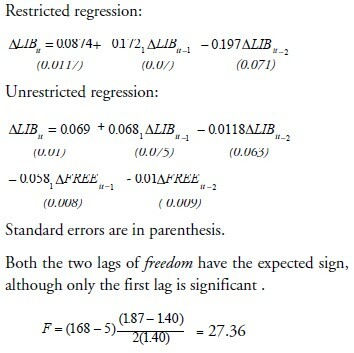 The latter constraints the number of lags in the next regressions. To test the direction of causality beween political freedom and economic liberalization, we used the annual index of political freedom (FREE) and the annual index of liberalization (LIB) described below. We will test whether lagged changes in FREE (Δ FREE) causes changes in LIB(Δ LIB). Due to constrains stemming from the length of the series, we used only two lags. We have decided to use first differences because of the non-stationarity of the economic liberalization index. This index is sticky downward: from a sample of more than 150 observations, just in two cases does the value of the index decrease. Using non-stationarity series in Granger test creates a kind of puzzle that has been adressed in other studies. As we mentioned previously, our sample consists of 28 countries in Eastern Europe, the former Soviet Union, China and Vietnam. The inputs for our model are the annual index of economic liberalization (LIB) and the index of political freedom (FREE) developed by Freedom House. LIB is the weighted average of 0 to 1 ratings of liberalization processes in three areas: liberalization of domestic markets and abolition of state trading monopolies (weighted with 0.3); liberalization of foreign trade regime (also weighted with 0.3); and privatization of small scale and large scale enterprises and banking sector reform (weighted with 0.4). The variable measuring political freedom (FREE) was obtained from the annual survey of freedom country scores also developed by Freedom House. This index accounts for political rights, civil liberties and freedom. Each of the first two is measured on a one to seven scale, with one representing the highest degree of freedom and seven the lowest. Freedom status results from the combined average of the fist two indices. Countries with averages between 1 and 2.5 are classified as Free; between 2.5 and 5 are partially free, and those with averages over 5 points are considered not free. With respect to the latter, we have to deal with the lack of time series with the same length for each country. This difficulty stems from the political-geographical changes in the former socialist bloc. For the former Soviet Union republics, historical series start in 1991; for the Czech Republic and Slovakia, the series begin in 1993; for the former republics of Yugoslavia, Croatia and Slovenia, 1991 is the first year, and for Macedonia it is 1992. Because the period of time considered goes from 1988 to 1998, we made some assumptions in order to alleviate the shortage of data and complete the series. For the ex-Soviet Union republics, the series were completed assigning to these countries, the values of the Soviet Union, from 1988 to 1990; for the Czech Republic and Slovakia, we used the same procedure but using values for the former Czechoslovakia, while in the case of former Yugoslavian republics, we used values assigned to Yugoslavia. 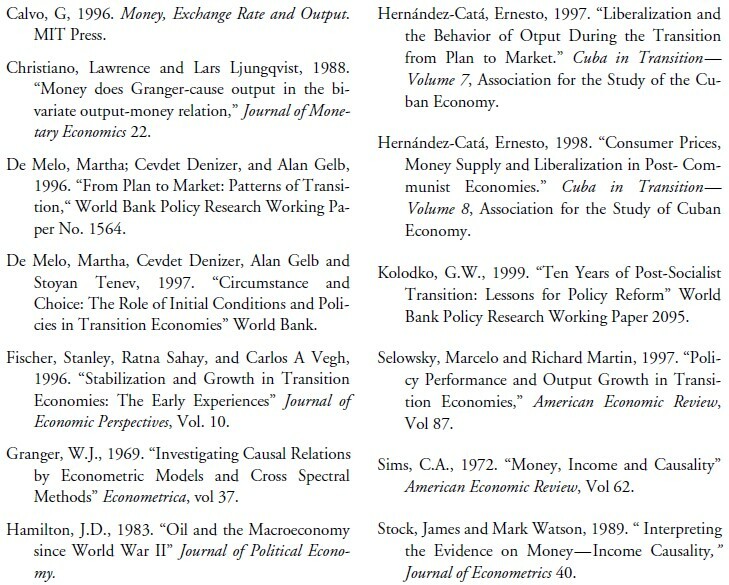 Historical series of the liberalization index (LIB) span the period 1989 to 1996. The length of LIB series is shorter than the length of the FREE series, so they are in fact a restriction to the studied period of time. This problem is even more restrictive, because of the need for lagging the variables. One more time, an assumption was made to compensate the lack of data. We assumed that the value of LIB in 1988 for all the countries of the sample, is the same as 1989. This assumption is not very restrictive, since most countries had levels of LIB close to zero in 1989. Only seven of the 28 countries included in the sample had levels over 0.2 and Vietnam is the only country with a level over 0.5. It could be also argued that countries with higher levels did not undergo substantial changes between 1988 and 1989. The radical reform program in Poland was started in 1990, while the high levels observed in the ex-Yugoslavian republics, China and Vietnam are the results of gradual liberalization programs initiated many years before 1989. The regression results are as follows. The p value is 0.000001; that means we can reject the null hypothesis at any level of significance. Despite the fact that we only used two lags, the result is very convincing: positive freedom changes explain significantly economic liberalization. It should be noted that the explanatory power of the first lag is by far larger than the second lag. The data indicate that the effects of political freedom on economic liberalization are felt very quickly. The p value is 0.97. In this case, we cannot reject the null hypotesis “Δ LIB does not cause Δ FREE” when we used two lags. It could be argued that the number of lags is not enough to reject the null hypothesis. Nonetheless, only the first lag has the anticipated sign. Therefore, it is not highly probable that we would obtain different results if more lags were included. The variable FREE Granger causes LIB, but not vice versa. So the link between political and economic liberalization is uni-directional. Since the end of the socialist system in Western Europe and the Soviet Union, the Cuban economy has undergone a process of reconfiguration and the economic links to western economies and Japan have been strengthened. The extremely inefficient system of economic planning, which resembled the Soviet model and made emphasis on industrialization, has been replaced with a new model where many subsidies and price regulations have been eliminated and tourism and export sectors play a key role. Like in China and Vietnam, the Cuban authorities have not let the reforms walk to the end, in an effort not to put at stake control by the communist party and preserve the current regime. Despite the fact that an index of economic liberalization for Cuba has not been computed yet, it is clear that the Cuban economy is more open and less regulated than ten years ago. If these indices were computed, perhaps the price index would get the highest score. Since the Cuban economy is extremely open and now depends heavily on foreign trade with capitalist partners, disregarding market prices would mean statewide bankruptcy. That is the reason why most prices have been liberalized. With respect to foreign trade, transactions conducted outside of market mechanisms and without market prices, which prevailed during the Soviet era, have almost disappeared, although the state controls these transactions by different means. However, the reluctance of the Cuban government to embark the country in a real process of economic reforms is noteworthy. In particular, the Cuban authorities have made only very few concessions to the private sector (even fewer than China and Vietnam). The state holds up a huge power that undoubtedly hinders the development of the private sector. Self-employed workers face abusive taxes aimed at preventing the expansion of self-employment. Unambiguously, within the current political system it is impossible to foresee a radical transformation capable of putting the Cuban economy on the path of sustainable growth. The findings of this paper are in line with the Cuban case. According to the survey by Freedom House, Cuba scores the top in lack of political freedom, which is proof of the lack of political and civil liberties in the island. Furthermore, an ordinary Cuban citizen is not allowed to set up any business with a foreign partner; only the State has such a privilege. There is no evidence of any improvement in the political field in the short run whatsoever. While the current absence of freedom in Cuba persists, a real process of privatization will not occur. It is evident that only a government fairly committed to democracy will be able to lead the transformation to a market economy. From the results obtained, we can make some important assertions. First, the results highlight the importance of an ad hoc political environment for a successful liberalization program. Unless the monopoly power held by Communist parties is removed, economic reforms will not be completed. Second, we should explain why in some countries classified as not free, the level of reforms is high. A possible explanation could be that authoritarian regime can tolerate some level of reforms, in particular in price liberalization. In fact, it could be profitable for these governments to get rid of some subsidies. Even public enterprises could get high profits selling products at market prices. Another issue is whether liberalization in countries with low levels of political freedom has led to a competitive environment or has only been a vehicle to transform former communist leaders into monopolistic capitalists. It is highly improbable that genuine privatization reform could be carried out without transparency and political freedom. On the contrary, under such circumstances privatization could bolster a non-competitive structure along with many economic distortions. It is also difficult to imagine a role for an autonomous Central Bank in this kind of nonpolitical repressed environment. The lack of political freedom implies that the role of international economic organizations is constrained up to its capacity to foster political freedom. Of course, in countries where high levels of political freedom have been achieved, it is very important to guarantee macroeconomic equilibrium lest economic instability jeopardize political gains. But it seems that foreign investment, new commercial links with developed countries and price liberalization do not by themselves generate better political conditions. The results may be interpreted as support for Kolodko’s (1997) statement on the importance of new and sound institutions for undertaking a liberalization program. However, we think it is worthwhile to clarify some aspects. First, the beginning of reforms can not wait until the political environment is completely transformed. In particular, the correction of price distortions can start inmediately. Second, an important political achievement creates an extraordinary oportunity to initiate the reforms and construct the new institutions that must not be missed. It is evident that gradualism is not a necessary condition to build and consolidate modern institutions. The evidence suggests that successful political reforms open a window for the implementation of radical economic reforms, though there is no reason to think that this window remains open indefinitely. Roberto Orro Fernández graduated as an economist from the University of Havana, Cuba. He holds a Master in Economics from el Colegio de México, one of the top institutions in the teaching of Economics in Latin America. Mr. Orro has accumulated a vast professional experience in different countries. He worked in the military construction sector in Cuba, as a lecturer researcher in the University of Havana, the University of Guanajuato, Mexico, and as an economic consultant for private firms in Puerto Rico. He currently works as an independent economic and financial consultant in San Juan, Puerto Rico. He is a member of the Board of the Association for the Study of the Cuban Economy since 1997 and has made contributions in the fields of monetary policy, dollarization in Cuba and economic and political transition in former socialist countries.